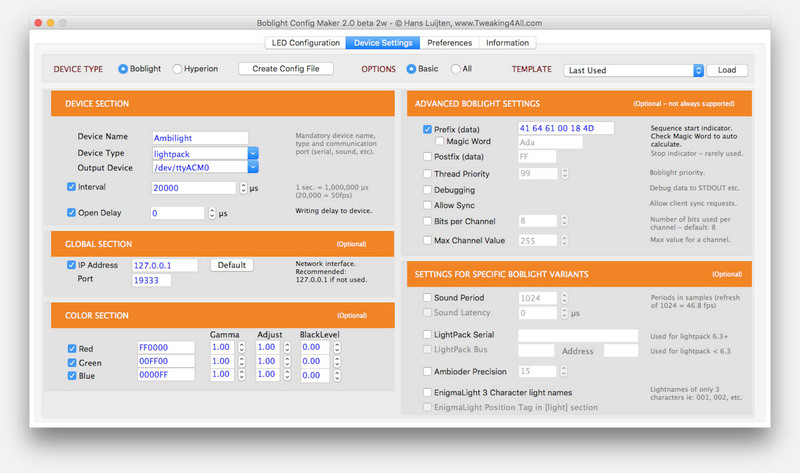 After many iterations of Boblight Config Maker, I’ve decided to finally release v2 … keep in mind that I have the feeling it’s not quite finished yet, so it’s released as a beta, by request of many v1 users. V2 has been rebuild complete from scratch, and (in my opinion) is not been quite perfect yet, but some will see benefit in this version as it adds a lot of new features. Since building and maintaining this application is simply taking way too much time, this will, unfortunately, most likely be the last version as well. As with many free or open source projects, this project is taking just too much time, and unfortunately, I do have to make a living as well. Note that for now the source will not be made public. UPDATE: For Windows and MacOS X I have fixed several bugs, a new version (beta 3) is available. I have posted this release separate from the original article intentionally, as I do not expect to post updates or support for this version. It is a beta version, which I originally did not intend to release, but some helpful folks and v1 users asked me to release it anyway, as it could be useful to some, and it covers some additional features not found in v1. As mentioned before, this project has consumed way too much time, and unfortunately, this is not my daytime job. So for now this will be the last version, and bug fixes will most likely not be addressed. Feel free to post them though – others might benefit from it and if I find a great sponsor I might pick this project up again. 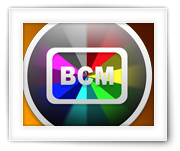 For Windows and MacOS X users, I’ve updated this version one more time fixing several bugs that have been reported. The application is probably still far from perfect, but at least I hope that this way it becomes a little bit useful. The start screen might look familiar, when comparing it to v1, but you’ll find some new features once you start working with it. This version does come with a wizard which is intended to make your start easier. The configuration options have been extended – more devices are now supported and one can even create templates for a given configuration, which can be reused at a later time. The configuration can be limited to basic settings, but also set to show all options (check the “Preferences” tab for more details). Note that it’s not a bad idea to check out the “Information” tab, which tells more about you some of the basic steps. 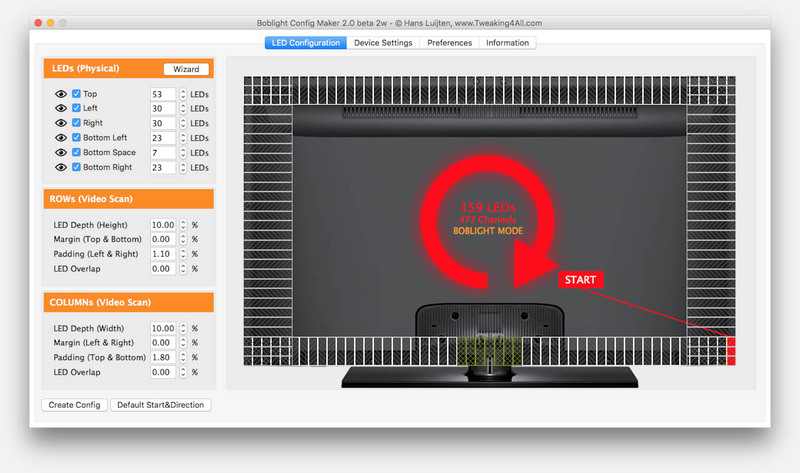 For more information I refer to the original Boblight Config Maker article. Don’t forget … There is an Info tab in the application which should get you started. There are 12 comments. You can read them below. wow this is awesome. This new version look very fresh and clean and should not be discontinued. But i understand fully reasons! thank you for your hard work its highly approciated. My setup is already working perfectly thanks to your articles! long life teweaking4all.com! Others have helped and given me input for this one (Thanks Andre and Hemertje!). But in the end it consumes so much time … and the “real” world kind-a requires an income of some sorts. I truly wish this could be a fulltime job . If you have any additional feedback; feel free to post it here. I’ll add it to my “To Do” list, I might pick this project up again in the future, who knows. The Windows version doesn’t save the file with the PERIOD sign (always saves the file with COMMAS).The Linux 64bit version worked well. Thanks for the tip – I had other users submit minor bugs as well. I only used the Wizard in this tool to see the correct options then inserted into the previous working version. Oh I couldn’t agree more … the main reason why I was reluctant to release it. I will try to look at some of the bugs, see if I can make something useful out of it anyway. Tried the tool a bit and it’s very useful but it has it bugs (version v2 BETA). First off thank you very much for your effort and time (this tool is a life saviour). Insert a COMMA after the “grabMenu” : FalseI also changed all True and False statements to lowercase but not sure if that is vital. Hope helps someone to save a minute or two. And again thank you very much for this tool!! I’ll take a look in the next few days, to see if there is a quick fix. It has a low priority at the moment (job hunting! ), but I will most certainly see what I can do. Thanks for the very good info though. – The LEDs were rotating the wrong direction, actually mirroring what it should be, this should be fixed. However boblight does not accept “negative” fields and fails. Correcting all values manually produces a working config. Thanks Jottt for pointing this out – with details how to fix it! I have “abandoned” the project a while ago, but maybe I’ll find some time in the next few weeks to see if I can fix this.